In our last World Tour of Design, we visited Spain and took a look at its Mediterranean-influenced architecture. In this week’s World Tour, I’m off to Kenya to explore the culture and design of this incredible country. Traversing the Kenyan plains on Safari is on my “wish list”, “to do list” and “bucket list”, but for now lets peek inside their design aesthetic. Much of Kenya’s current art and design pulls inspiration from the natural environment and the rich cultural heritage of its various tribes. Modern Kenyan artists frequently paint semi-abstracted human figures, similar to the distorted figures commonly seen in the sculpture of the region. Sculpture itself is very prominent in Kenyan design, and including more three-dimensional work than paintings in your home decorating is a great way to incorporate some of the atmosphere of Kenya in your home. 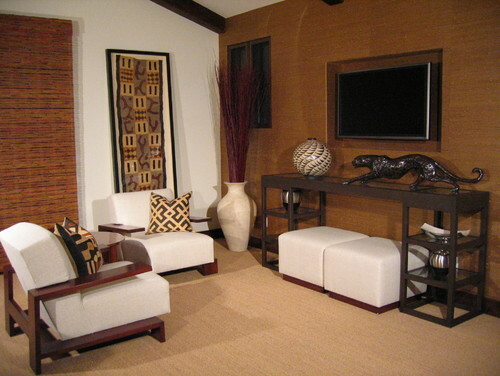 Natural materials, particularly wood and plant material like palm and grasses, are also commonly featured in Kenyan design. Wood furniture, especially in organic forms, and decorative plants can be used in your home’s interior to further enhance a Kenyan design theme. Printed fabrics are another heavily-used element in Kenyan design and culture. Colors tend to be warm and reflect the tans, golds, reds, and oranges of the Savannah. Introduce some geometric patterns in the fabrics and small touches of animal print in your design. I would love to help you design a home with inspiration from Kenyan art and culture! Just contact me at Interior Makeovers Inc. by calling 310-788-0990 or emailing Lori@InteriorMakeovers.com!